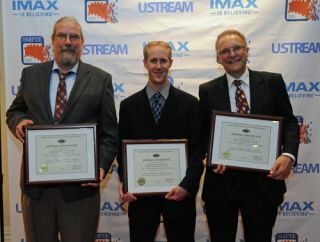 Meyer Sound getting an industry award– it’s kind of a dog bites man story. John Meyer for his many technical innovations, and Helen Meyer for her pioneering role in the industry– we’ve seen them (along with many of their employees) garner dozens of well-deserved awards over the years. Meyer is one of the iconic organizations in the audio world. Congrats to Meyer Sound. And as for cinema– we’re heading into a new era where audio innovations will be one of the next big drivers in the quest to differentiate the commercial movie theater experience. The 27-page paper presents an investigation of the acoustical interaction between loudspeakers and cinema screens of both perforated and woven construction. By employing both large sections of screen in front of loudspeakers in an anechoic chamber and smaller sections inside a plane wave tube, the authors were able to present a detailed evaluation of the screen materials’ effect on sound transmission into the room, as well as any effects of sound reflected back into the loudspeaker. The results of the research should lead to improved optimization techniques for cinema sound by providing insights into the selection of screen materials, setting of distance between loudspeaker and screen, and DSP tuning and measurement procedures.